Would giving the title of engineer protected status in the UK improve the public status of the profession? Certain professions have protected titles so why should engineering be any different? This is the question we put in last week’s poll and the results from over 700 votes indicate a bias to protecting the title of engineer. 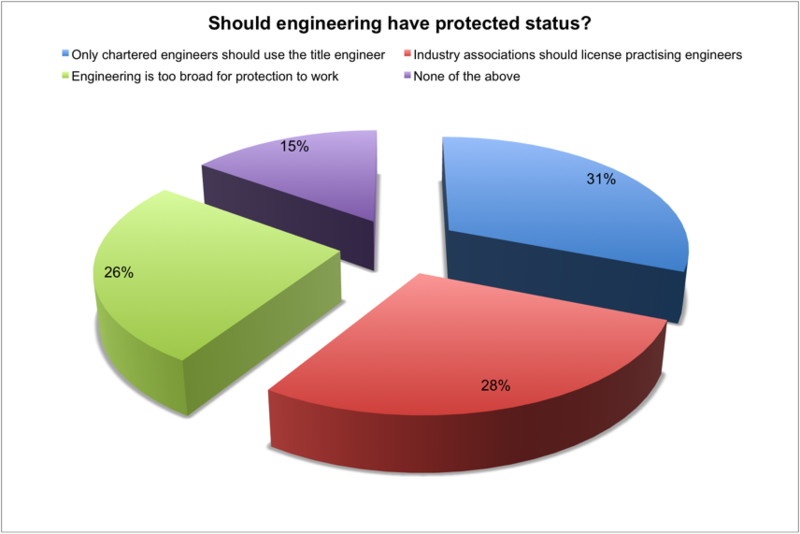 In total, 31 per cent of respondents thought that only chartered engineer should use the title engineer; and 28 per cent agreed that industry associations should license practicing engineers . Of the remaining 41 per cent, 26 per cent thought that engineering is too broad for protection to work, whilst 15 per cent couldn’t find a fit with the options presented to them. This comment is one of 72 generated so far by the poll, but what do you think? Let us know below. Chartered engineers already have “chartered engineer” as a protected title. If no one other than them could call themselves an engineer at all, then what point would there be in keeping the “chartered”? Through the industry associations however, we already have an existing framework which could be used to protect the status of the name. Simply being a member of an association with the correct membership grade should be sufficient. There is no reason to exclude the washing machine repair person from calling themselves an engineer either, but they should still need to be registered with a relevant association and be suitably qualified. We already have CORGI for gas installers, such training and qualification should entitle someone to call themselves an engineer, and though less critical to safety, any washing machine repairer should also need to be qualified to a good standard. We all know that part of the problem is the derivation of the term in our language. …. and I don’t want us to say that Casey Jones wasn’t an “Engineer” which I assume, in that context, meant a person in charge of an engine. Like the other comments, we need something better than the old-fashioned and out-dated institutions to issue professional certification. A degree is certainly not proof of expertise or experience, but neither is the C.Eng. route as presently operated. Many first class engineers do not hold degrees and many poor engineers have degrees: how to progress is a big question! Somehow I see little relation between the question and the answer options. – an engineering degree (bachelor, master or doctor) from a university is required. That would exclude all who are just mechanics or electricians from a vocational school. But it would include those who do not want to spend hundreds of pounds annually for chartered memberships in some fraternity or club. So a qualification is all you need to prove you are an engineer. I do not mean to be rude but in my working life I have come across too many educated idiots and unqualified geniuses alike. A qualification is not enough I feel. I whole-heartedly agree : ALSO! – the European languages treat Engineer differently in other ways, also – eg in Germany, the terms “Agraringenieur” & “Landschaftsingenieur” use the term where the -ingenieur is not specifically anything to do with “engineering”, other than in the same way as Politicians “Engineer” or ‘scheme’ something to someone’s advantage / disadvantage ……. Well, nowadays the Germans throw away their own traditions and adopt everything from abroad – kebap from the Turks, bachelor and master from the Americans, engineer from the Brits, chop suey, wontons, etc. If you are looking for the “German Engineer” look for Dipl.-Ing. in the title (requires at least 8 semester university plus a final research work of half year to be to be examined by the professors of that field). To top that, look for an apprenticeship beforehand. For two/three/four years practical work. If you don’t trust universities in vetting engineers through exams and tests and dissertations, why would you trust a membership institution who first care about membership fee. If it works in other countries, where the status of Engineers is much higher, then why not here? I am coming to the end of my career and have for the last 25 years designed and set up in production a range of mechanical products. These sell in around 50 different countries all over the world and have the reputation for quality and reliability. These machines have kept more than 20 people employed over this period of time. I am only qualified to HNC level and have never found the need to join an association. I like to think of myself as an engineer, in fact I am proud to think of myself as such. However, had there been a proper joint recognised structure set up by the associations I feel I would have joined to be able to enjoy the status I have worked hard to achieve, rather than have it diluted by those who have not. The term engineer is widely used from ‘domestic engineers’ (cleaners), ‘Motor Engineers’ (mechanics, though some may be engineers) to washing machine fixers etc. Ideally an engineer should be chartered, though that may be elitist and also denigrate people who have years of experience but maybe not the paperwork (certificates etc.) or the backing of a professional body. I would like the profession to be viewed in the same way as doctors etc. and have protected status. So something down the line of Ralphs reply with provision for time served engineers (lets say 15 years in a technical capacity. I’m with Ralph on this; having a degree should have been one of the poll options (hence none of the above). Yes an NO – what about HND’s or even C&G’s ? I am originally from the UK, but now live in Australia. I spent many years studying and worked hard for my degree and there after my CEng status. I was totally disappointed when the MIEE was devalued to MIET. In Australia the situation is even worse. Electricians with a few years part time college education are more highly paid than fully qualified Electrical Engineers, and the general public have no idea what is the difference in the qualification. The government also wonders why there is a shortage of Engineering Students ! I agree with you Mike, in the UK under the new part P system, we now have “electricians” who qualify to wire houses and domestic premises after a 5 WEEK training course, and a set of regulations so obscure and non understandable that I am surprised no one has published “A guide to the guide to the IET regulations” Having worked in a number of new housing developments installing extra equipment, I can assure you that standards have gone THROUGH THE FLOOR as well! It would be wrong to restrict the title of Engineer to only Chartered Engineers. Incorporate Engineers, Technician Engineers and Engineers that aren’t members of professional institutions nor working towards registered status are equally deserving of being known as Engineers if they have the academic qualifications and employed in Engineering. It would be better to encourage registration with a institution and to be a “Registered Engineer” regardless of Chartered/Incorporated/Technician status. The person with a spanner who fixes the washing machine has a title – technician, why are they calling themselves engineer? Does that mean because I took an applied science degree that I am a neuro-surgeon by default, hardly. Why would any young person good at STEM subjects aspire to fix washing machines? You miss-read what I wrote. Earlier comments suggested restricting the title of Engineer to only those who had gained Chartered Status. I am only saying that this is too restrictive. There are many Engineers out there who are in my opinion equally entitled to call themselves Engineers that have a range of other qualifications including Incorporate Engineer, EngTech, HNDs, HNCs, apprentiships and years of on the job learning and experience. I certainly wouldn’t call someone who fixes a washing machine and Engineer, but what about someone who’s responsible for the maintenance and smooth running of a highly specialised radar system or missile launcher on a Royal Navy ship? The knowledge and skills involved are much more than is required to fix a washing machine. I agree with Ralph, being an ‘Engineer’ should be based on a qualification, not on membership of an institution or association. Firstly I have to declare I am not degree qualified and therefore do not hold a Chartered title. I have worked as a contractor, overseas, in General Engineering , Automotive, Petrochemical, Aerospace, and now work within the Nuclear sector. Fast approaching 60 years of age I have had the privilege of working with some of the best Engineers I have ever met – many of whom also didn’t have a degree to their name but could not only think sequentially but also laterally and could solve complex problems and arrive at decisions far quicker than most highly qualified and certified Engineers. Put it another way – does relevant engineering experience still count for something? I may appear biased but surely as far as Engineering is concerned practical application is what engineering is really about – isn’t it? If so then discussions about “Titles” are irrelevant. Yes I think it does / did – sadly I have an MSc(AgrEng) with a lot of experience over a similar time frame as you, hands on, BUT the Young of Today in Management – and I lay the blame with H.Resources for not seeing / recognising the value of people with distinguished service experience. I fall over so many graduate engineers who cannot work out some simple mechanics ( PHYSICS) …. I have always felt there is a grey area between an engineer & a technician. It is my view that a technician diagnoses a fault, draws a new replacement part & fits it. An engineer builds something from scratch. I am a craftsman & consider myself to be an engineer, I do not believe a degree is required to classify you as an engineer. So for me none of the above. I completely agree with Ralph and Chris. Also, why should some one who has worked hard to earn their degree in Engineering be excluded purely because they “do not want to spend hundreds of pounds annually for chartered memberships in some fraternity or club”. I found them to be a very expensive subscription for an obscure monthly magazine. Just like to add that, coming from a magazine that doesn’t know the difference between a blast furnace, and an open hearth furnace, this poll is “A bit rich”!! When did we get that wrong? I put some pics of the ACTUAL Victoria blast furnace also! Was that a single mistake made by a junior reporter back in the 1970s? Or did they just refuse to write about you? I can think of a few biomedical engineers who might make that mistake. I believe the engineer is already protected in his industry to the extent of his degree, associations, certifications beyond the degree, and experience (whether good, bad, or indifferent). I may have opinions about certain engineering topics, and they may (or may not) be relevant, but that is part of a discussion with one or more engineers. I may not put my designs out there as engineered items, even if they have been thoroughly engineered (thought up, designed, made) by me. They are for my own purposes and use. If something needs to go commercial, it is easy enough to protect it legally to the extent current law can be effective. It still requires an engineers review, approval, and certification of the design if it must meet certain legal safety standards that exist. Yes, you put that so eloquently. So if someone just decides about things but does not create new things, he can’t be an engineer? So who should then decide whether someone is an engineer? If he had to give up creation and tweaking for examining, then non-engineers would decide about engineers? Where is the limit? In the US, Professional Engineers are protected, Engineers are generally protected, and engineers are not. Each country would have to modify this to reflect local culture and language. As with many of the above responses, there are FAR too few options to choose from. Chartered or Incorporated Engineers already have protected status, and the use of this term is reasonable for them. Most people who use the term engineer (not capitalised) are really technicians (mostly very competent!). People can be engineers without being a member of an Institution and this membership should not be the effective defining qualification. If legislation said that to call yourself an Engineer you should have an appropriate suite of qualifications then that would help, and if the only way that would work was an Institutional membership of Member or Fellow then fine, but the membership fees should not be onerous or a bar, especially given current economic times or even for those retired! I think there is too much snobbish thinking in our culture to attempt to improve the image of engineers by Registration. I am now retired but spent many years working as an engineer and retired from the post of Chief Engineer. Over the years I had staff who were qualified via HNC and others with PhDs. Some were brilliant, some were not. The technical qualification was not as important as their personal qualities. Some were leaders, some followers. I would not trust Institutions to Register the right ones. Status, like respect, should be earned, not demanded or legislated to prove! MANY have degrees, but few will ever do anything groundbreaking, innovative or revolutionary. Oh so true. The name thing comes up whenever engineers start feeling sorry for themselves. “Why must I be misunderstood?” as the song goes. Engineers won’t get respect or understanding simply by expropriating a label. To get that they have to learn how to communicate and take every opportunity to explain what they get up to and why it is important. Don’t start from the basis that if someone does not understand you they are thick. Look at the explanation you gave and ask yourself how you can make yourself understood. As the saying goes “get down with the kids”. I can remember this topic being a hot subject of debate almost 50 years ago, and we still haven’t resolved it! There is a strong argument for having a protected name for the profession, but unfortunately the term ‘Engineer’ has been hijacked by mostly ill-informed journalists for so long that I doubt if it can be unraveled. The nearest anyone could get 50 years ago was ‘Ingeneur’ ! It wasn’t acceptable then either! Professional engineering is a profession and should be recognised and protected as such just as medical, legal and financial professions are. This statement is in no way intended to denigrate the work of gas fitters, electricians, mechanics and indeed all the other trades which in every day life are important. Trades and vocations should be recognised as such since they play vital roles in our lives, but they do not have the training to perform the roles expected of the professions. Unfortunately successive governments seem to have forgotten this and seem to want all school leavers to have degrees, many of them in such obscure subjects to be of little use to the individual or the general community. Is it not about time to bring some old fashioned realism into our society and recognise jobs and people for the skills they bring, the roles they play and the relative importance each has to creating wealth and service to the general community and country. We should stop people believing that they are something they are not, but recognise them for what they are. We should also stop encouraging some youngsters to continue with academic education when their skills would be better channeled into trades. Not that many years ago people were proud to be recognised for the trades and skills they possessed, whatever happened to those times? Most of the people here opposing this seems to be those from HND. I cant fathom how apprenticeships/technical colleges courses designed for people with C grade level academia, be comparable to our A/B grade requiring degree programmes with advanced maths chemistry and physics. I as a student find it insulting to be compared with a HND let alone, a boiler repair men. I have a degree in Chem Eng. and Ph.D., but am still a “boiler repair man” and employ several graduate boiler repair men. The degree is a good starting point but the old HNC route was often better for field engineers. I agree with Stephen Whiteley’s comments above and hope that you have read the correspondence as it is illuminating, even if long discussed. Maybe for you boiler repairs went well, and I’m sure I would of done the same thing in your case. BUT, my point is that the engineers with actual Beng/Meng degrees in Engineering are not the same at all to a boiler repair man or even a HND/HNC, or any other route. None of those will have done anything like the advanced modules I have completed at university, we are 2 different things, yet utilising the name engineer enroaches on our brand. Whether we like it or not brand and status reflects on most importantly wages, and this is an encroachment onto our business. I may sound snobbish, but their is something severely wrong with engineering institutions, they’re not protecting us. Not just what I’ve mentioned but even we have universities flooding the market, with engineering courses, you can get C grades and enter a engineering course with such a low academic rigour and than call yourself an engineer. Students at these institutes are baffled by my universities first year coursework, it’s ridiculous. Essentially my rant is that I’m studying some really advanced topics, using maths on the level of maths degrees, and we have others who have barely studied at our level using our branding. The problem is far worse than just boiler repair men. I make no apologies for my elitism. I’d also just like to add a point to further my case. Have a look at student numbers over they year for Chem Eng. You will find them in icheme website. The growth is staggering, I don’t know how the job supply is going to keep up unless Britain goes into some new golden age of manufacturing. Generally speaking in my 45 years of engineeering , having a degree and a 5 year technical apprenticeship with its associated Full Technologocal certificate (and Cert Ed in Fe qualifying me to lecture upstart students like you ) Having worked in the automotive industry (including F1 )and currently aerospace I have found that HNC qualified engineers were more useful than HND qualified (tho’ pretty close) and the least useful were the purely academical engineers with Alevels and degree. They are ok on theory but virtually useless at anything practical or value added. (Due to government education cut backs in the 70’s and high unemployment levels I didn’t have the luxury of taking A levels and staying on at school until I could get a job , so I resent your remarks ,UK ChemEng Student 1st September 2016 at 5:51 am . This letter reminds me of my favourite line in ‘Last of the Summer Wine’ when Clegg said someone ‘had been to night school for five years and become a First Class Pratt’. I did a five year apprenticship resulting in an HND and Part 4 of the IEE Exams along with several others, many of whom have gone on to have very responsible positions in a wide range of Elecrical Engineering. My son has a Masters Degree in Electrical Engineering but I doubt whether I would have been a better Engineer had I also obtained a degree. I left the then IEE because they seemed more concerned with counting electrons than projecting the value of Engineers and Engineering in contrast to many of the Chartered Institutions. I have pointed out to a friend, a now retired Medical Professor, that without Engineers they would still be relying on leeches. The importance of Engineering is what we need to get through to the general public. I wish you well in your chosen career, however I suspect you will find the the real world a bit of an eye opener if you adopt this attitude with your colleagues. I consider myself an Engineer, I served a 5 year apprenticship as an aircraft toolmaker with Vickers and BAC. I have run my own business for 45 years selling, installing and repairing large and small air compressors, welding plant, power tools. Installing air systems in large and small factories and advising clients on HAVS, air purity for breathing and carrying out pressure vessel examinations for insurance companies. In all that time I have never had my experience questioned or my qualifications doubted. I have had graduates apply for jobs who have refered to themselves as “Engineers” expecting to get a highly paid job but having no hands on experience and expecting me to train them whilst paying them top dollar. Engineers are the salt of the earth and should therefore be held in the highest esteme, not denegrated. Don’t look down on the washing machine repair man. You might need him one day. Chartered Engineers already have ‘protected status’ and the proposal to have only chartered engineers allowed to use the term engineer excludes all those with HNC/HND qualifications , time served 5 year engineering appenticeships and years of relevant experience all of whom should have the right to call themselves engineers. If we exclude these then the term is in danger of becoming elitist and the snobbery effect that comes in doing so. Membership of a recognised engineering institution is one way with the institute setting acceptance criteria based on both qualifications and experience which must be proved. I am currently taking the part-time route on a Mech. Eng. course. Some of my classmates who were full-time have now graduated (on an accredited course, no less, giving them easy access to IMechE titles) – and I am sorry to say that for some of them their grasp of basic engineering principles is severely lacking. One of my most disheartening experiences was having to explain to a couple of 2nd year students how a lathe worked. After 10 minutes I gave up trying to get them to understand how the cutting was performed on a rotating workpiece rather than using a rotating cutter. I didn’t get anywhere near discussing cross-slides, screw cutting, feeds and speeds, or rake angles. They just couldn’t figure it out. So, in my view there needs to be more than a qualification (read about the oft-mentioned “paper engineer”) to discern those with actual skill, knowledge, experience, aptitude, and/or understanding from students whose only skill is excellent information retention. A more rigorous acceptance test for CEng status, some aptitude tests for professional body membership, all would go some way here. Or, perhaps, an overhaul of the education system by those who know what industry demands. A mandatory year as a fitter, machinist, assembler, welder, fabricator, etc. (prior to attending any classes) would be a start. Give people the foundations to build on, otherwise they’re simply number crunchers with no clue how real life systems go together. I support the idea of a protected status for Engineers, and I get a bit cross when I read comments equating this to “snobbery”. Scientists and Engineers are the backbone of the modern world, and as a nation we are foolish to ignore Engineering as a key aspiration for our children and grandchildren. It is no coincidence that our economy has migrated away from manufacturing to finance and the so called service sector; and it is also no coincidence that our nation’s current account is at the biggest deficit in 50 years. The degradation of engineering as a career is just one factor, but I believe it is an important one. We can all think of people who have no qualifications and are excellent engineers; and people with the highest degrees who we would not trust to change a light bulb. This is irrelevant. What we are talking about is the norm – the 99% – the boys and girls in our schools who are good at maths and science and good with their hands. We must provide them with a clear and valued career that gives them a goal to achieve and a status in society that their peers will understand in the same way that they understand “I am a doctor”, or “I am an accountant”. I am not hung up on Chartered Engineer being the only way – I have never become Chartered, as it has never been an issue of importance in my working life. Membership of one of the Engineering Institutions (I belong to the IET) could easily be the benchmark – allowing these bodies to set their entrance criteria appropriately, and to allow for the “maverick engineers with no degree” to achieve membership through other routes. My final point is to do with the “virtualization” of engineering. We have been told in the last 30 years that we don’t need to manufacture anything here. We just need to be good at innovation and intellectual property, and wealth and prosperity will follow. The sale of ARM Holdings to the Japanese company Softbank puts a dagger through the heart of that argument. We must re-discover Engineering as a key profession in our country. I’m afraid the horse bolted years ago and getting things to change now is not going to happen. I am currently a 60 year old Senior Design Engineer at an aerospace company and did a 5 year technical apprenticeship and spent 6 years at a technical college. I used to belong to the Institute of Production Engineers but stopped my membership after paying a load of money for no real benefit. An engineer must earn respect and not just by being a member of an elitist society. I know of several chartered engineers who are very superior in manner but I would pay in brass washers. As will be obvious from the name box, I believe myself to be an engineer and pay a significant amount of money to a number of “engineering institutions” to validate that title. Are they value for money? Intrinsically I’m not convinced, but many of the areas I work within demand chartered status, so chartered membership of a recognised institution is a means to an end. Is this demand justified? No, probably not but it is a short-cut for the employer or client to prune the list of candidates for jobs, contracts etc beyond the contents of a simple CV by using membership of the learned institution as a further means of validating an individual’s qualifications, if not ability. In a world of limited career opportunities this is important. So, chartered status should not be simply given away or it becomes (or maybe has become) devalued, but having started out with an HND I agree with others who have posted that we must not exclude those without a degree from chartered status or Engineering. The industrial placements which were part of my HND course were at least as valuable as the theory taught in classes, if not more so. I don’t believe that any of the choices in the survey are the answer and like many others have voted “none of the above”, which means that if the profession is to achieve better status for Engineers then the institutions (and/or the Engineering Council) have a great deal of work to do. That it needs doing is demonstrated by the oft quoted survey of senior girls in a Manchester grammar school, (as referenced by The Engineer in “Recognition impossible?” in January 2013) who, without a mention of a Whittle, Telford, Brunel or Whitworth voted that the most famous engineer from the UK was the Kevin the mechanic from the garage in ITV’s Coronation Street; the situation does not appear to have improved over the intervening three years. I fix my own cars and washing machine. Our status? perception is reality (sadly!) and as long as the ‘meja’ -popular- keep on linking ‘us’ to mechanics in the popular mind-set, we will stay at the bottom of the heap! All the ideas offered by fellow-bloggers have value: keep on the good work! proud to be recognised for the trades and skills they possessed, whatever happened to those times? The grocer’s daughter and the fly-boys who sold off the family silver saw them off! Still proud to to “be recognised for the trades and skills” I possess, as I always seem to have been for over thirty five years in the profession. However, such recognition is earned, not given. I am sorry Mike (Blamey), the rot started long before your alleged assassins. K**, Chartered Engineer and proud of it. If only we could have harnessed the energy wasted on debating this topic of the course of my engineering career and used it for something positive! Nothing has changed over the last 40 years, nor will it in the foreseeable future. Every time this topic comes up there are the same tiresome clichés repeated again and again: “I trained as an apprentice and have never met a graduate who knew how to work a lathe / which end of a spanner to hold / how many spirit level bubbles you get in a packet” ” people who mend washing machines aren’t / are (delete as appropriate) proper Engineers” – I could go on, but I it is just too dispiriting. No wonder the rest of the population has such a low regard of engineers. Mike Blamey is a bit carried away about the Grocers Daughter I’m afraid. It is over 50 years since the institutions (run even then predominantly by academics (as expressing prejudice is part of the fun here)) decided that to achieve acceptable status for engineers that the part time route to Chartered status was to be abandoned. They then found that a degree didn’t do it and made a masters degree necessary, in the mean time Chartered Accountants have increased in number with no diminution of status. And guess what, you can still become a Chartered Accountant by part time study and the institutions have arranged with universities to ‘retrospectively convert’ part of the qualification to a degree (as some USA employers require). 3)Engineers have got to recognise that engineering is ONLY about money (it is the lack of understanding this that has destroyed much of industry). Of course I would say that, having just graduated from university with a degree accredited by the RAeS. But I see no reason why professional bodies like these cannot vet individuals who got into engineering from various routes (including ones other than a degree) so they may call themselves “engineer” in their given field. In the end I don’t think limiting who can call themselves an engineer will have much effect on the prestige in which engineers are held just as I don’t think its reasonable to expect the general public to know what I do in my specialist field of aerospace when they cannot be expected to encounter it in their everyday lives. You may be surprised what the average Joe knows if you care to specify your field but don’t expect the average dinner party attendee to gasp if they are not themselves a “technologist” let alone a trained engineer. Great debate again, a lot of the content is really about remuneration and status. It is possibly worth comparing with the so-called professions. Lawyers are increasing exponentially, following the lead from the USA: It is not necessary to have a degree in law to become a lawyer or barrister. Accountants regulate their professional numbers carefully as do the medical profession. The biggest failure of the Engineering Institutions is not enforcing professional certification of documents that are used in most areas of engineering (only structural engineers and some HV engineers have to certify documents). In the USA many tasks have to be signed-off by P.Eng. qualified people. However, as commented above, our institutions are run primarily for and by academics. As a mere boiler engineer (see above), I regularly see hazardous (boiler and power) plant being operated and maintained by inadequately skilled people: so far as they meet the insurers requirements all is regarded as being fine. I thought this had been done to death in the IET forums! Given that the Engineering Council (EngC for added sexiness) doesn’t give a hoot about Engineers, or so it appears, who would commission this? Certainly the institutions (learned bodies for added sexiness) don’t really care either. I pay through the nose or chartership and member I don’t get anything from either the EngC or the learned body (LerBo for added sexiness). Was Fred Dibnah an engineer – I think so Yet he never had a degree or was a member of any elitist but inconsequential intstution . Many of the comments show that “Engineering” is too broad a subject to cover in one title. Unfortunately it also shows quite an unfortunate attitude towards others who may have different levels of degree attainment – verging on snobbery. A qualification is a useful start and shows potential, but some of the worst engineers I’ve known can only work in theory. It is perhaps informative to question why certain professions such as accountancy & medical doctoring so carefully regulate who may claim to be a professional in that field. In every case it seems to be because a layman’s life (or large amounts of their money) is in someone else’s hands so they need a way of ensuring that the professional is to be trusted. Engineers by contrast tend to be employed by & for companies or organizations already possessing extensive knowledge of said engineers’ field. If the engineer does shoddy work it will often be spotted and he will be out of a job long before his work makes it to the general public. The exception to this that has been mentioned are for example civil engineers who must sign off a structure that the general public will trust their lives to from the moment it opens. Without this clear need for vetting engineers for the benefit of non-engineers I just don’t see his job title becoming protected beyond certification by a professional body that will be known mainly to just that professional body. Oh well, but without telling the GP that I want an X-ray to check up my leg pain I’d never get one. A car mechanic was repairing the engine of a heart surgeon’s car and said ” The engine is the car’s heart, so why am I paid so poorly compared with you when I repair hearts too”. The heart surgeon said “Try it with the engine running…..”. From south Texas/USA, working in petrochem for decades, BSEE, IEEE member since mids 1980’s, EIT(USA’s first test required to become a “Professional Engineer” aka PE) since 1989, with current Job Title “Chief Engineer” but state laws do not allow the use of “engineer” on a business card. At 60, having more letters behind my name means nothing unless one is forced to work on public sector projects and then being a “PE” is required. Here it would take about $2500 USD for a multi-week study course/test preparation and then an 8 hour headache-of-a-test….I’ll skip it for now. I agree strongly with Malcolm Purvis, application of engineering and all that goes with it plus the ability to think outside of the norm is a huge part of this. I too have seen many with no formal college degree do what I would call “engineering” in solving problems and making things work correctly and safely. I’ve also seen folks with a long string of letters(M.S., PhD., P.E.) behind their names unable to begin to solve simple problems. You may want to adopt the USA version where projects that directly affect public safety REQUIRE the use of licensed(chartered) engineers who have been tested and show the minimum required competency(they passed the test). No easy answer. Bridges will still collapse, power or communications’ systems fail, machines fail, sometimes the engineer blamed, sometimes the contractor/builder blamed, sometimes Murphy laughs at us all. I have set up and run an aircraft company’s design office, had over 25 years in engineering design at all levels, help set up 2 factories from scratch as part of a small dedicated team, been responsible for a number of new product projects within a management role, have been heavily involved in the design of cutting edge technology and am currently responsible for design and IT in a small company. I do not have a degree. Should I, and others like me, not be allowed to call ourselves engineers? I followed the academic route into engineering and have been fortunate to work worth a lot of first rate engineers with and without academic qualifications. The Institutions are full of academic engineers, so emphasise the degree route nowadays. They used to allow far more for experience and expertise in evaluating professional suitability than they do now. In my view the whole spectrum of engineers is valuable and while the superior academics have their place, and are generally well rewarded for their qualifications, engineering -business developers and hand-on mechanics who move forward in the industries are also worthy of being called engineers. The grade of Associate seems to have all but vanished now. Agreed. Either qualifications, knowledge and experience, or a combination of both should allow the title of Engineer to be used, certainly not just holding a particular qualification. A certain level of understanding should need to be demonstrated though regardless of how it has been gained. I have worked with programmers who have lots of experience but no qualification – some of it is all about doing the wrong thing because they never got some of the theory/indoctrination they needed. If your experience is great then getting the qualification shouldn’t be too hard and it means less pointless discussions where people don’t understand where they are each “coming from”. What I miss in software is the ability to know if the person that I’m talking to has ever been forced to learn about the complexity of algorithms, big O notation, state machines, encapsulation, polymorphism and whether they “get” the idea of agile development or not. If they haven’t then I know we are going to get stuck in stupid technical arguments – over-optimization of things that don’t matter, poor choice of algorithms when it really does matter, code with lots of states for which there is no defined behaviour, planning indicipline and so on. Interestingly, there is one comment on this blog for every year of my life! Does that make me an Engineer: being able to see a completely nonsensical ‘link’ between two measures/numbers. Here’s how to get noticed, recognition, a salary much more than you deserve. Become a member of a Union (lets call it “the Law Society” or “the Bar Council” to give it some kudos?) Only start to look into an issue when you are guaranteed payment, whether you succeed, lose, or simply walk away if its too difficult. Ensure that every project we attempt makes work for four other sets of our ‘kind’ and that we delay developing any solution for as long as we can, to increase our reward. Ensure that we only start to cure ‘mental diseases’ spread by others of our ‘craft’ – and that throughout any ‘cure’ we might consider, others are deliberately re-contaminating any wound, trying to strip-off any dressing and generally disrupting our good intentions. Call the entire episode -just like prostitutes -the Game: and that any check is only from others more senior in the pyramid(s) of power our profession has developed over the 500 years we have had the opportunity to get away with it! Establish such a system and we have it made. We will almost certainly be horrified by/ashamed of what we have done: so removing all integrity, honesty and decency from our thinking will also be required. I can give a fresh graduate with no on the job experience a year to settle into a role and after that his practical work is indistinguishable from that of an apprenticed person. As Engineering degrees are considered amongst academia as one of the hardest subjects to study due to the level of maths, physics and science, I can never reasonably expect to fill in the knowledge gap between an apprentice and a degree level graduate. On the surface of things both appear to work equally well in the work place, because they both work within the confines of their well defined and practiced roles, but throw in something unexpected, cutting edge and challenging then the gradauate excels. This is why there are roles in industry that exclude anyone below the level of degree. The graduate is also capable of achieving registration easier and sooner, bringing the benefitS of that registration to the employer and his investors. Engineering IS a profession that is professionally regulated, and has been so in one form or another for many generations, only verified members of that profession should be called by the professions namesake. You either meet the requirements to be listed on the legal register sanctioned by Royal charter or you don’t- it’s black and white.